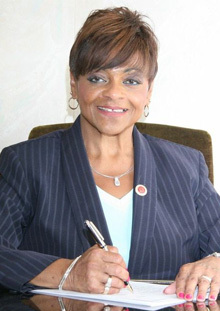 Ms. Dickens was first elected to office in 1974 as a County Committeewoman, County Judicial Committeewoman and State Committeewoman and eventually rose in party ranks to become the highest-ranking African American woman in the New York State Democratic party serving as the First Vice Chair of the New York State Democratic Committee. Ms. Dickens stepped down as First Vice Chair when she took the oath of office on January 1, 2006, after winning a hotly contested City Council race. She became the Council Member for the 9th Council District serving the communities of Central Harlem, Morningside Heights, part of the Upper West Side and East Side. As a newly elected Council Member, Ms. Dickens hit the ground running after Speaker Christine Quinn appointed her to the leadership position of Majority Whip and Chair of the Standing Committee on Standards and Ethics. During her tenure in office, Inez E. Dickens has brought millions of dollars in services and resources to her community, the 9th Council District and to economically distressed communities throughout the City of New York. She has also fought to make our great city a welcoming port-of-call to all and to build futures of promise for her constituents and all New Yorkers.